Welcome to my new site! It has been almost a month since I started blogging. (My first post was on Mar 2) What started out of curiosity without much thoughts has turned into a real passion for me. Besides what to cook for dinner, what has consumed my mind these day is also how to shoot the dinner. I have also begun to read up on a photography book on lighting called Light: Science and Magic: An Introduction to Photographic Lighting . Hopefully I would be able to improve on my food pix. So, I think it is time to give the blog a better name to replace Babooblah. Jasmine tea is one of my favorite tea with mild fragrant and soothing flavor. It can accompany any meals and desserts and is just as good by itself. I would like to invite you to have a cup of jasmine tea with me and we will talk about cooking, photography and other stuffs. 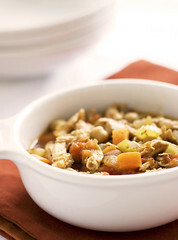 The recipe I'd like to share with you this time is Giada De Laurentiis' chicken stew. You can find the original recipe here. It is quick and easy to make and yet it is also hearty with lots of flavors. It is a satisfying light meal to have with some bread. Although N is not a soup/stew person, he usually ate a full bowl of it with half loaf of bread and asked for more. As usual, I have modified the recipe to incorporate a little bit more seasonings and also changed some of the steps as well. Brown the chicken - Heat 1 Tbsp of oil in a heavy 5 1/2 quart saucepan over medium heat. When the oil is hot but not smoking, brown the chicken breast skin size down first, 3 to 4 mins on both sides, until the pink is almost gone. Remove chicken from saucepan, discard the skins. Saute the veggies - With the oil from the chicken in the saucepan over medium heat, (add more olive oil to make up to about 2 Tbsp), saute the celery, carrot and onion until the onion is translucent, about 4 to 5 mins. Add the minced garlic to the veggies and stir for a few seconds. Season the veggies with salt and pepper to taste. Add liquid, seasonings and chicken - Stir in tomatoes with juices, chicken broth, basil, tomato paste, bay leaf, thyme, Italian seasonings and red pepper flakes. Put the chicken breasts and any juice came out back the pan, press to submerge. Let it simmer - Bring the cooking liquid to a boil and turn down the heat to medium0low and simmer gently, uncovered, until the chicken is almost cooked through, about 25 mins. Flip over the chicken breast and stir the mixture occassionally. Add beans - Take out the chicken breasts and let it cool for 5 mins.Add the chickpeas and simmer until the liquid has reduced to stew consistency, about 10 mins. 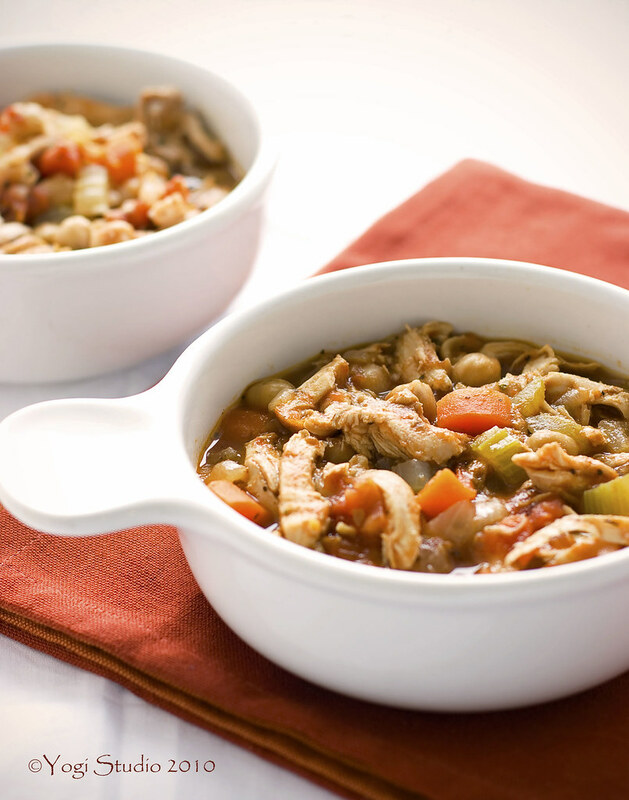 Add shredded chicken - Remove and discard the bones from the chicken breast. Shred or cut chicken into bite-size pieces. Return the chicken meat to the stew. Bring the stew to a simmer. Season with salt and pepper to taste. Serve hot. You can also use chicken thighs. But whatever parts of chicken you are using, make sure they are bone-in, because this is where the flavor comes from. Of course, you can use other types of beans, such as kidney beans or cannellini beans. As with other stews, it tastes even better if you can make it ahead and let all the flavors melt together. ooh that looks so yummy and it is soup season. i'm gonna try this one. Yummy!I would like to visit again.